In Iowa, the vice president said he should be judged by whether the middle class was growing stronger. Is that really what he wants? Until the shooting in the Washington Navy Yard cast a pall over the city, Monday was supposed to be a day for President Obama to mark the fifth anniversary of the financial crash and tout his administration's handling of the economic recovery. His argument -- in remarks at the White House that were overshadowed by the massacre -- in a document released over the weekend, and repeatedly over the last few years has been simple enough: No, things aren't where they need to be, but they would have been so much worse if we hadn't done what we did. "It could have been worse" isn't the most compelling case, but it is one that many economists agree with, at least in broad strokes. Obama's successful reelection suggests that voters, though somewhat skeptical of his handling of the economy, didn't completely reject it. Is Biden serious? If so, it sure seems like he shouldn't be running for president or mugging in front of hay bales. Pick any one of the many figures about the middle class. Median household income is in the U.S. in the midst of its worst 12-year stretch since the Great Depression. That's actually lower than when the recession officially ended in 2009. Between 2007 and 2010, the median net worth of U.S. households tumbled 47 percent to its lowest level in more than four decades. And so on. The numbers show the middle class is getting squeezed. 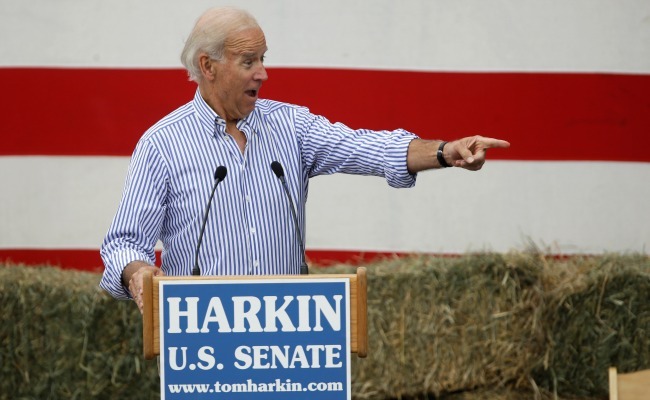 Biden's exuberance seems to have gotten the better of him here. The Obama Administration may indeed be worried about the middle class, and there's still a long time to go before the 2016 Iowa caucuses. But given the past four years' trend and the painfully slow rate of economic growth today, asking to be assessed on the whether the middle class has gotten stronger is asking for a harsh report card.